When considering cinema as poetry, there is Brakhage, who described his own process as an attempt to create poetry, or perhaps Godard, as Kent Jones has discussed; there is the trance-like state of Tarkovsky and the transcendental state of Malick. But even if two of those mentioned beckon from the world of Thoreau, where is the American poet? The one, to quote Whitman, who is “the great individual, fluid as Nature, chaste, affectionate, compassionate, fully armed.” Cinema has gifted us many great individuals, but perhaps not in the way Whitman composed them — a type of American attitude that is once in search of greatness but finds it through modesty, where a handshake can feel cosmic in its scale. We can engage with symbolic presence in cinema — the fact that the image is not just an image but the image — in any film. But what is it in John Ford’s images, and in his darkest film, My Darling Clementine, that makes it feel like one of the few works of American poetry on film? Like Whitman before him, Ford’s films continually tap into a consciousness that feels distinctly bred out of 250 years of searching of an identity born in constant flux. And thus the paradox of Ford emerges: characters with a slow, mannered type of speech fit for their simple backgrounds and simple desires, but elevated to the status of Great Men and Great Women, made mythic through a mise-en-scene that pictorially destines them, without ever reducing their physical bodies to an iconic parade as Norman Rockwell would do. Instead, Ford’s essential trait is this humility, the fundamental trait of American goodness he would recognize in film after film. My Darling Clementine, which has been acutely restored for its Criterion Blu-ray debut, sits at a key moment in the Ford filmography. While known as a filmmaker of Westerns, his sound period had been largely absent of them beyond the one-two punch of Stagecoach and Drums Along the Mohawk in 1939. 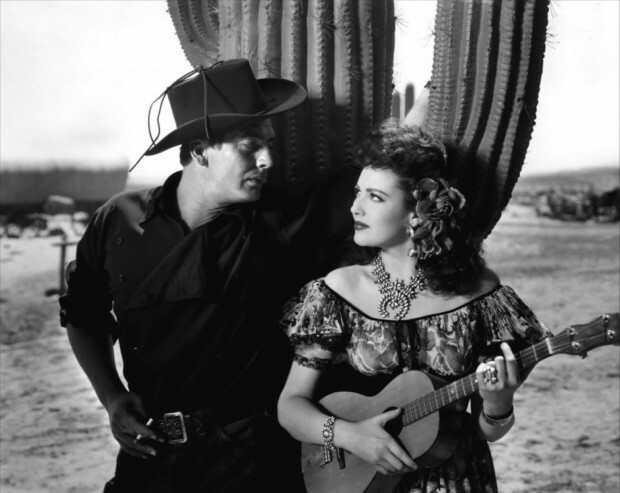 My Darling Clementine in 1946 would be the first of a dozen Westerns he would then make. It was also his last film in collaboration with Darryl F. Zanuck of 20th Century Fox, who had been a key editor for many of his films, for better and for worse. And most essentially, it was Ford’s second film following the war that had scarred him in many ways. They Were Expendable was his only film to directly address World War II, yet the pains of the war are evident in every Ford film that followed. While I would hasten to call My Darling Clementine a postwar movie, following the film through its genre interpretations only creates a skeletal form of what made Ford’s poetry. In a reading of the film as a Western, the film follows an individual of justice, Wyatt Earp (Henry Fonda), bringing civility to a town that has none. There’s a good eastern woman, whose name adorns the title (tranquilly embodied by Cathy Downs), contrasted with the Latino-western woman (Linda Darnell) of low moral standards. There is ultimately a promise of civility by way of a half-built church, the scent left by a barber, and a stagecoach interrupting the climatic battle. This is to say, My Darling Clementine has all the makings of what we expect to watch when we view a Western. However, that is not why the film’s mysterious aura feels so haunted compared to the other icons of the genre. After a long collaboration with veteran cinematographer Joseph August (including the war), John Ford collaborated with Joseph MacDonald on My Darling Clementine. If August had learned much of his work from the silent era of pictures (his 1922 William S. Hart picture Travelin’ On shares a clear relationship to German Expressionism), MacDonald brought a quality of the slowly ubiquitous postwar style of lighting to My Darling Clementine (the DP would bring harder edges to collaborations with Kazan, Fuller, and Hathaway). I would hasten to call Ford’s film a film noir, but there is certainly air of pessimism hangs throughout the film in a way different from the Ford of the pre-war. Doc Holliday (Victor Mature) has ran from the East, hiding a guilty past we can never know. Violence has an impact that feels utterly reprehensible — the edit to the boom of a shotgun in the Clanton home remains one of Ford’s most shocking displays of inhumanity. And while Monument Valley is present, the images are literally darker, as Tag Ghallager notes in his video essay for the Blu-Ray, Day-for-night photography provides a bleak vision of the landscape; the ever present clouds creating a ceiling, denying the infinity of possibility that the Western has so often promised. Of all the revered auteurs, the ones that still give that word meaning, Ford was respected in part by those who spilled ink along the pages of Cahiers Du Cinema, but rarely the passion given to Hawks, Hitchcock, Ray, and beyond. Perhaps this was part power play — Ford was well respected in the United States, and a four-time Oscar winner — but I’d like to think there’s something quintessentially lost in translation in Ford’s depiction of American life. Again, we return to the moments that stick out in Ford’s films. My mind jumps to Fonda’s slow deliberation of whether to dance with Ms. Clementine, eventually chucking his hat, and the way Downs gives a slightly embarrassed smile for his all too groomed hair. I think of Fonda dancing in his chair like a child to the annoyance of Chihuahua. There is the way Wyatt and Doc speak to each other, using shorthand American lingo, while acknowledging the pauses speak to a deeper resentment. There is the way smoke fills each room with a distinct fill of a lived-in presence, existing independently of any beauty to be foregrounded. And there’s that final handshake between Wyatt and Clementine — a moment only seen in the “pre-release” version on the Blu-Ray (test audiences forced Zanuck to replace it with a gentle kiss) — perhaps a promise for the future, but more likely an acknowledgment of the temporary peace. Ford’s great moments as poet happened pictorially — within a singular shot rather than the way he edits them into space. For Ford, space is a given, where the dynamic shadows of the landscape form a painterly backdrop (one that drove Manny Farber mad). But it was about bringing these paintings alive through the gestures of his actors, and ones often shot in medium shots, rarely emphasized by the camera. His presentation emphasized a complexity within its own simplicity. T.S. Elliot once remarked that poetry was not “the expression of personality, but an escape from personality.” Perhaps this is what moved Ford away from the auteurs and toward the poets — his presence is felt, but not so fervently as the beloved of Cahiers. His camera simply captured an American ethos succinctly and directly, and a painfully felt one in My Darling Clementine: a yearning for an American myth, though perhaps one lost before it even became legend. My Darling Clementine is now available on Criterion.